Accommodation is still available for families over the Easter weekend (18/22 April) and Biker's weekend (26/27 April). Sea Breeze in Shelly Beach offers 3 self catering units (1 King bedroom/bathroom, 2 Queen Bedrooms with 2 bathrooms and 3 bedroom unit with King bedroom ensuite and 2 Double Bedroom that share a bathroom.) This is small family venue and we are not able to provide accommodate for more than 12 people and possibly 2-3 children. Please do not request accommodation for more than we are able to accommodate. Sea Breeze is ideally located for business people and holiday travellers. 2 blocks from the beach and a block from Shelly Centre. The units have DSTV Commercial, fully equipped kitchens and a braai facility. 3 Self Catering Units that sleep 2, 4 and 6. Well-behaved pets are welcome. Please discuss in advance. This is a family venue in a suburban area. Our guests come here on business, on a family holiday or to relax and unwind. The price is per unit for the number of guests booked as per the quote. Additional guests / visitors are not permitted. We adhere to the municipal by-laws regarding the number of people allowed on the property. We also adhere to the law. Drugs, prostitution, gambling, fireworks, etc. are not permitted. 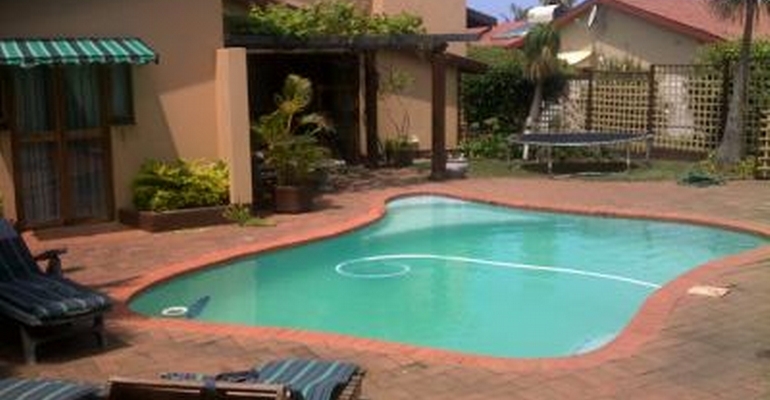 From R400.00 - R1800.00 per night depending on the unit and the season. 3 units with 6 bedrooms and 5 bathrooms.